Real-time apps, or evented apps that incorporate push-based interactivity, are the basis for a new generation of in-browser capabilities such as chat, large-scale games, collaborative editing and low-latency notifications. Though there are many technologies supporting the real-time movemement, four stand out in particular: Ruby, Node.js, MongoDB and Socket.IO. This article walks you through both the architecture and code for building a real-time app with these technologies. Basic Node.js knowledge, including an installed version of Node.js and NPM. Sample code for this article’s Ruby data-writer component and Node.js web application is available on GitHub. The TractorPush real-time application uses a Ruby-based data component to push messages into a queue in MongoDb that is then received by the Node.js web app and pushed to users’ browsers via Socket.IO. In effect, the entire stack works in a push notification manner. The system shares a backing service (MongoDB) which acts as the glue that connects the independent apps that make up the whole. Queues are a powerful mechanism for describing interoperating but independent processes. There are tens if not hundreds of commercially viable solutions, from the venerable and widely implemented IBM WebSphere MQ to newer open-source and open-standards ones like RabbitMQ and ZeroMQ. MongoDB serves as a capable polyglot message-queue because of its flexible document storage capabilities, wide-variety of supported languages and tailable cursor “push” feature. Marshalling and unmarshalling of arbitrarily complex JSON messages is handled automatically. Safe-writes are enabled for improved message durability and reliability, and tailable cursors are used to “push” data from MongoDB to Node.js. Ruby’s mature web frameworks (Rails, Sinatra) make it ideal for the user-facing portion of most web apps which is often the origin of queued messages. TractorPush simulates this with a data-writer written in Ruby. Clone the app from GitHub and create the app on Heroku. Provision the MongoLab add-on to create the MongoDB instance that will contain the message queue. A MongoDB capped collection supports tailable cursors which allows MongoDB to push data to the listeners. If this type of cursor reaches the end of the result set, instead of returning with an exception, it blocks until new documents are inserted into the collection, returning the new document. Also capped collections are extremely high performance. In fact, MongoDB internally uses a capped collection for storing the operations log (or oplog). As a trade-off, capped collections are fixed (i.e. “capped” in size) and not shardable. For many applications this is acceptable. The TractorPush application relies on a capped collection in MongoDB to store messages. Open the MongoLab add-on dashboard for the writer app with heroku addons:open mongolab and add a new collection using the “Add” button. Name the collection messages and expand the advanced options to specify a capped collection of 8,000,000 bytes (ample space for the demo). We have created the message writer app on Heroku and have configured the MongoLab add-on. Next, deploy the application to Heroku. The TractorPush writer is a simple and headless Ruby program that writes a message to the MongoDB database. Looking at the Procfile reveals that the writer process type is labeled worker. Scale the worker process to a single dyno to begin queuing messages. Verify that the worker process is running with heroku ps. The TractorPush application uses three types of document-based messages to demonstrate the flexibility of MongoDB object marshalling/unmarshalling: simple (or name-value), array and complex (or nested document) messages. The writer.rb script writes one of the three document types to a MongoDB collection at a default rate of one per second. The :safe write-option ensures that the database has received and acknowledged the message document without error. You can also access the MongoLab add-on dashboard with heroku addons:open mongolab to view the increase in the collection’s contents and document count. Viewing the logs shows the message types as they’re queued. Because the messages collection is a capped collection old documents will be discarded if the collection size exceeds its limit. The consumer side of the system is a Node.js web application that consumes messages from the capped collection. Clone the app locally and create the app on Heroku. In order to use two language environments (Node.js and Ruby) as a single system the two applications must share the message-store. Share the MongoDB instance between the writer and web apps by copying the MONGOLAB_URI config var from the writer app and setting it on the Node.js web app. Removing the mongolab add-on from tp-writer, or destroying the app itself, will irreversibly de-provision the database even though it’s still referenced from tp-web. Be careful of such situations when working with shared resources. Applications deployed with a web process type will automatically be scaled to one web dyno. Deploy the Node.js app to Heroku and check the status of the web process with heroku ps. Run heroku open to open the application in your browser to see the JSON form of each message type being pushed, in real-time, from the Ruby writer app to the Node.js web app and finally to your browser. 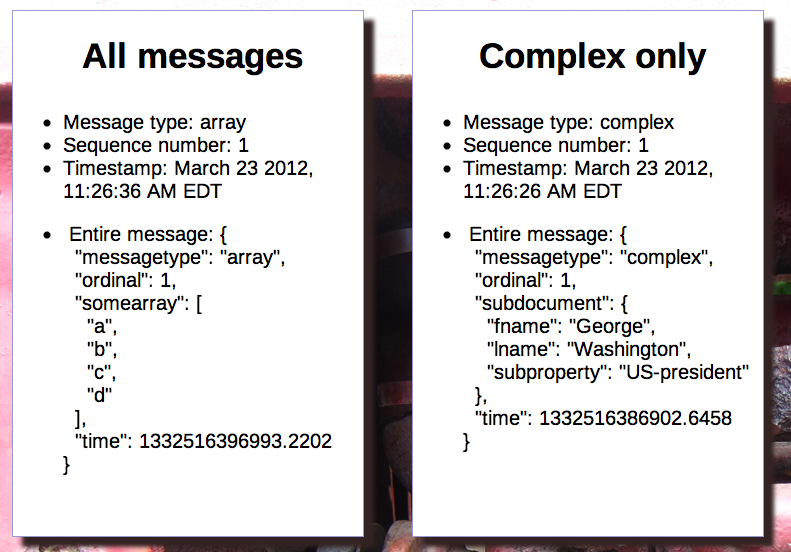 The readAndSend function in app.js of the Node.js web app is responsible for consuming the messages sent to the capped collection by the ruby data writer component. The call to collection.find returns a cursor that iterates over all documents in the messages collection. The 'tailable' option specifies for the cursor to wait for additional data if it’s reached the end of the result-set, thus mimicking real-time message receiving behavior. For demonstration of listening to multiple queues an additional collection.find call does the same for only complex message types. Notice that each iteration of the cursor emits the message document using socket.emit. This pushes the message document (a JSON object) from the server to any connected browser clients. The library that powers this client-push feature is called Socket.IO. The Node.js web application serves up a single index.html page that uses Socket.IO to open a connection to the server and create a listener attached to message types ‘all’ and ‘complex’. True bi-directional messaging with WebSockets is also available. In reality, the client is polling the server for more data as the server-side Socket.IO configuration forces the connection to utilize XHR-polling with a 10-second timeout. Once the browser has shown all available messages it will stop. As new messages are inserted into the database, the browser will be pushed the new messages and resume. The four technologies covered in this article are just one of many combinations that support a componentized real-time app. More fundamental is the role MongoDB’s data-flexibility and Cedar’s polyglot capabilities play in eschewing monolithic applications for a more modular system design.